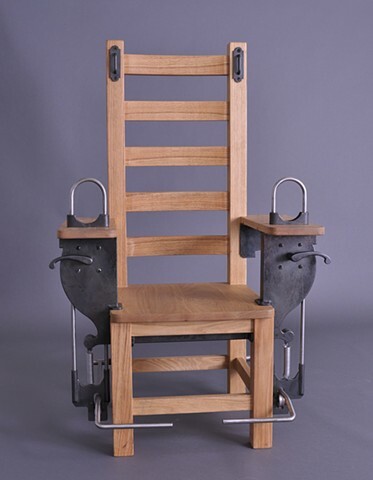 This chair of imprisonment was designed to be self activated. The hand cuffs are closed by foot pedals and released by the levers under the arm rests. If one hand is locked in then the occupant can still reach over and release them self, but if the second arm is locked in, then the occupant must negotiate with someone to be let out. The work is intended to address issues of intentionallity and for what reasons people give up their liberties or even give their trust.